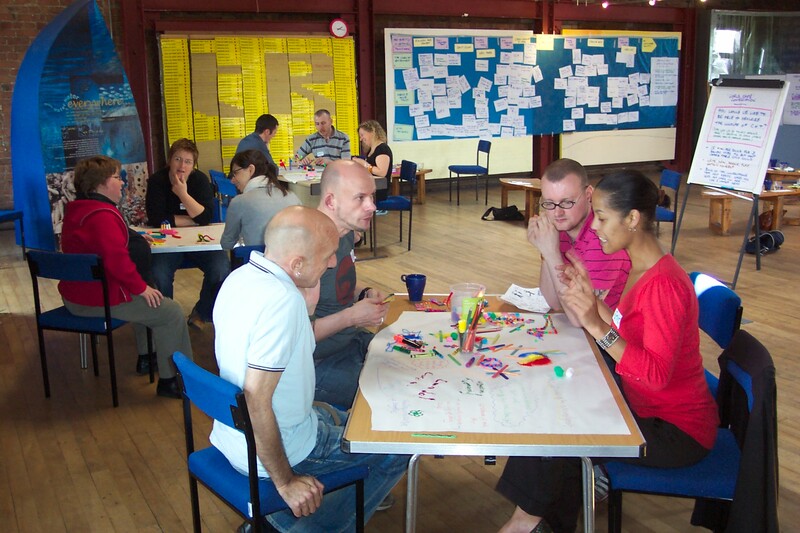 This ToP facilitation case study from the archive was first written for and published in 2009 by ICA:UK. George House Trust (GHT) is the HIV voluntary organisation for the North West of England. It supports people living with and affected by HIV, and campaigns for the best quality of life for all people with HIV. ICA:UK was approached in July 2007 to design and facilitate a staff Away Day later that month. GHT had undergone substantial change in the last couple of years – including significant expansion of the staff team and it’s service delivery, turnover of some senior staff, and subsequent restructuring of management posts. A need had been felt for an externally facilitated process to allow staff to unpack and reflect together on this recent past, at what was felt to be a turning point before looking ahead by means of a fresh strategic planning process later in the year. Around a dozen of the full staff team of 14 were to attend – including one very new, a few new within the past few years, and others with a long history of service. As an organisation involved in hard campaigning on controversial issues in a sometimes highly politicised environment, the staff team comprised strong advocates and activists. to have some fun, and rebuild stronger bonds and a sense of team spirit. The two key elements of the process design were the ToP (Technology of Participation) ‘Wall of Wonder’ (or ‘Historical Scan’) method, used in the morning to enable the group to reflect together on its recent past, and the World Café method, used in the afternoon to enable the group to articulate creatively “how it would like to be able to describe the culture of GHT”. The documentation of the day included the aims and outline of the process, participants’ hopes & fears and ground rules, a full verbatim record of the Wall of Wonder and World Café sessions with photos of the sticky wall and decorated table cloths, and detailed feedback from participants’ evaluation forms. An effective team will always need to invest in “time out” in order to continue functioning well. The organisation had gone through significant change, and inevitably we needed to re-group and re-establish the frameworks that make the organisation such a formidable force to be reckoned with. ICA facilitated an excellent day which helped to enable us to go from strength to strength. Posted on January 16, 2014 by Martin Gilbraith. This entry was posted in archive and tagged Away Day, case study, facilitation, HIV, ICA:UK, Manchester, Technology of Participation, Wall of Wonder, world cafe. Bookmark the permalink. Thanks Jim, not beyond the quote from Chief Executive Michelle Reid some months afterwards, although I know that she has moved on from GHT since then. I do try to follow-up more rigorously on outcomes and impact when I can, although generally for larger scale projects. What do you do to follow-up? Very nice. Given your other post on impact awards, any sense of what happened out of this?